Truly the Ultimate Pocket Guide on GD&T, this informative guide is the perfect on-the-job pocket reference for your GD&T needs. It’s an economical reference tool you can’t afford to be without and a must for anyone who uses engineering drawings. It’s a must for anyone who uses engineering drawings. Order one for each member of your team! 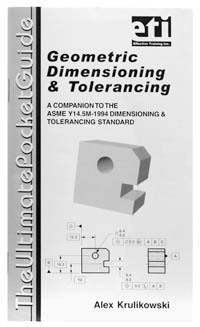 Product goal: The Ultimate Pocket Guide on Geometric Dimensioning and Tolerancing is a handy reference tool in one convenient pocket-sized package. Carry it with you on the job and have a resource to all your GD&T questions at your fingertips. This product is a valuable tool for: Designers; product, manufacturing, and quality engineers; CMM operators; checkers; GD&T instructors; consultants; training departments; and anyone else who uses GD&T on the job. Package includes: Drawings, examples, charts, definitions, rules, and concepts of GD&T sized to fit neatly in a shirt pocket.